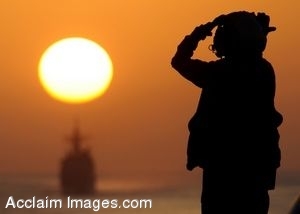 Description: Clip art photograph of a U.S. Navy Aviation Boatswain's Mate, (Handling) 3rd Class Cassandra Carpenter as she signals to aircraft on the flight deck of the Nimitz-class aircraft carrier USS Dwight D. Eisenhower (CVN 69) during a vertical replenishment in the Arabian Sea April 9, 2009. (DoD photo Mass Communication Specialist 2nd Class Rafael Figueroa Medina, U.S. Navy). Clipart photograph by Department of Defense Public Domain.